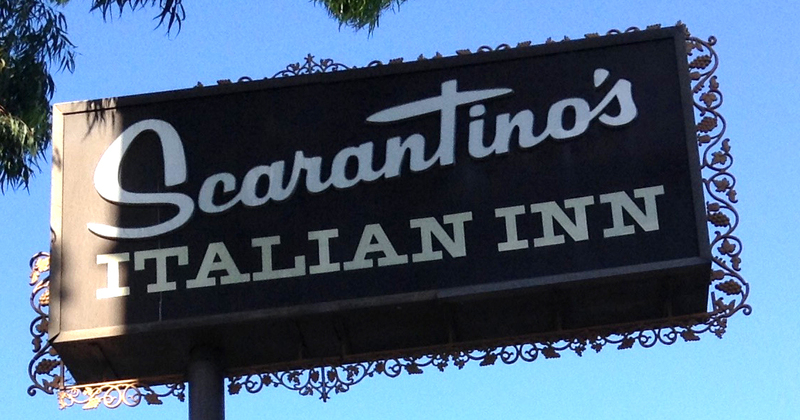 (1967) Scarantino’s Italian Inn, Glendale | Remains of L.A.
– Large rectangular room with brown booths and chairs and red-checked tablecloths. Wood panelling up about two thirds of the wall, with paintings of grapes and wine bottles hung here and there . 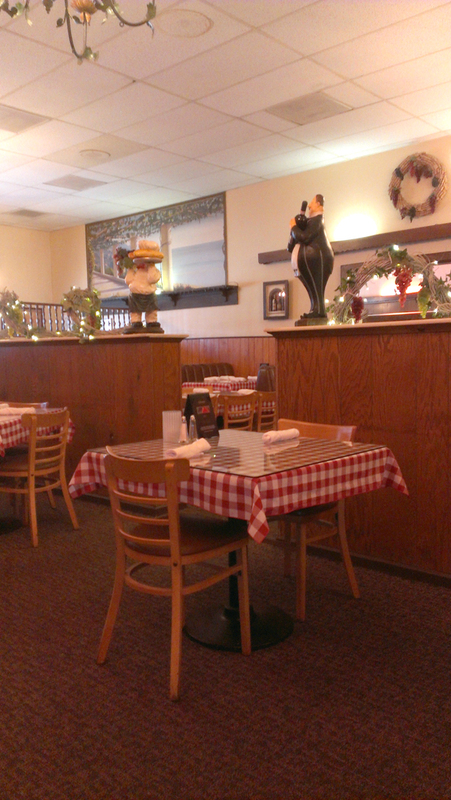 A low wall running down the middle of the room makes it a little less box-like; on the wall are swirling grape vines with white xmas lights and two extremely silly statues of comical Italian waiters. You know the ones I mean. I do not understand why those are made or bought. On one wall near the entrance was a mural of a vineyard near the ocean and it was quite pretty, but the really spectacular thing was the mural of Venice canals on the back wall. Stunning, almost a line drawing, and frustratingly hard to examine closely because of a shuttered partition blocking off the serving prep area. The place over all seemed less cozy than it should have, and I eventually decided that was due to the false acoustic ceiling; it gave it something of a feel of a fast food place. Maybe if the light was lower? I don’t know. Of course I was there in the afternoon; it might be a lot more dim and cozy in the evening. 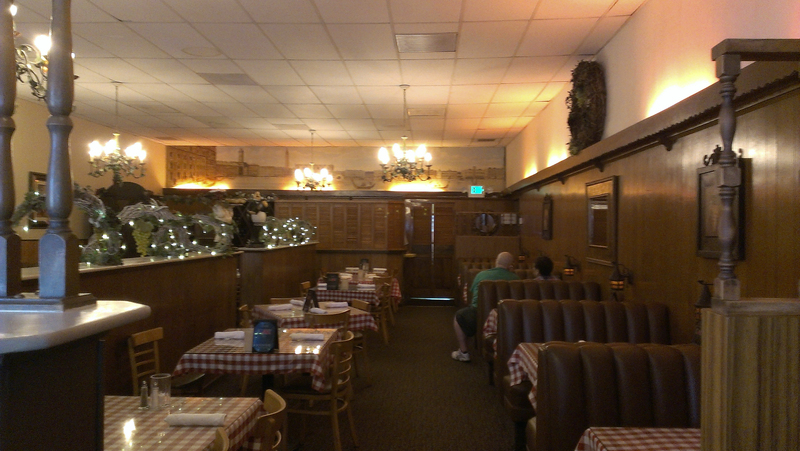 Each booth has a very charming little iron lantern hanging from the wall, I bet when those are lit it’s really lovely. -I ordered the gnocchi and couldn’t decide between meat sauce or marinara with meatballs. I asked the waitress what she thought, and she was oddly hesitant to make a suggestion but finally said that they make the meatballs themselves so I got the meatballs and was glad; they were fantastic. The meal came with both soup–minestrone; creamier than I’m used to but in a really good way–and a salad, which was mostly lettuce and chopped tomatoes, which I like so incredibly much more than cherry tomatoes. There was also bread, crusty and delicious. I was worried by the end of the salad how I was going to eat the gnocchi and did end up taking more than half of it home, but it was even better heated up later. -As I walked in, there was a woman on her phone, glaring out the window, saying angrily, “now he’s going into the motel across the street–doubt he has a room there. Oh now he’s coming out of the parking lot–I’m not leaving until he goes away.” I know it was certainly some weird guy who was harassing her on the street or something, but isn’t it more fun to imagine she has a hatred of pigeons so extreme she doesn’t realize they can’t rent rooms at motels? Anyway she sounded mad rather than scared so it didn’t seem like she needed my help. -Next to the front door was the most elegant gumball machine I’ve ever seen. All dark brown mahogany. It looked like the gum inside was just regular, though. -My menu had two pages –one towards the front, one towards the back– headed “meatless dishes” with all the same things listed; I hesitated because I hate being all high-maintenance but finally asked the waitress what was up and it turned out the first “meatless dishes” page was supposed to be the page of appetizers. She brought me a different menu and I felt like I should get an appetizer to make up for her trouble, but I really didn’t want one and it’s a good thing I didn’t get one what with the huge amount of soup and salad and everything. -Shortly after I sat down, an elderly couple came and sat down in the booth adjoining mine, both on the same side, facing me. They were right there. If I glanced up from my food I was staring directly at them. I’m sure they were nice people, but really. Also I’m sorry but their table manners weren’t great. -By the bathrooms was a whole lot of pictures of little league teams the restaurant has sponsored over the years, soccer and softball mostly. I wonder if at the end of the season the team gets to come here for dinner? I think that all my end-of-the-season little league parties were in people’s backyards, but we weren’t sponsored by a restaurant. I don’t think. -A man eating alone near me made a noise so loud I thought maybe something horrible had happened, but it turned out he was just slurping his soup. I don’t know how he managed to make it that loud, but he did it with every single spoonful. -The music was all quiet Italian opera, then changed suddenly and jarringly to the song “Love and Marriage.” Of course I know that was a song before it was the theme song to the 80’s sitcom “Married with Children,” but all I can think of when I hear it is the dreadful Al Bundy and his dreadful wife. -When it was time to go, I asked for a containers for my leftovers and a man came and carefully boxed it all up for me in a way that made me feel very well cared for. -I believe I have written before about how awful it is being alone at a restaurant and wanting to use the restroom before leaving if you have a doggy bag. One does not want to take the leftovers into the bathroom cause that’s weird, but also if you leave them on the table the waitress might think you’ve left and forgotten them and throw them out. I finally left my jacket at the table with the leftovers, and it was fine, but you’d think considering how much I love going to restaurants alone, I would have by now figured out a non-awkward way to handle that. What I Read While I Ate: The Enchanted Castle by E Nesbit, which I’ve read before and keep on the kindle app on my phone, along with various other old free books I can dip into whenever. E Nesbit wrote at the beginning of the 20th century and is probably my very favorite children’s author. It could be a tie with Roald Dahl except he almost certainly couldn’t have written the books he did if she hadn’t written hers first. What Sort of Ghost I’d Expect to Find if I Believed in Ghosts Which I do Not: A little league softball team, eating pizza and celebrating the end of a great season. Note: Unless otherwise stated, all ghosts mentioned in this blog died peacefully of old age and then reverted to the age/place of their choosing.